Since I made the maple raisin scones using millet flour, I have been interested in learning more about whole grains. Since my use of millet flour was such a success, what other whole grains could I use? Grains are the seeds of certain plants. Inside the seed is the germ, and attached to the germ is a starch called the endosperm. Both are protected inside the bran that surrounds them. When grains are refined, the bran and germ are stripped away, leaving the starchy part that is less nutritious. When in the grocery store, look for labels that list whole wheat flour, whole oats, or other whole grains. Wheat flour is not a whole grain. The following chart is adapted from the Whole Foods Market Magazine, North Atlantic Region, Spring 2011. 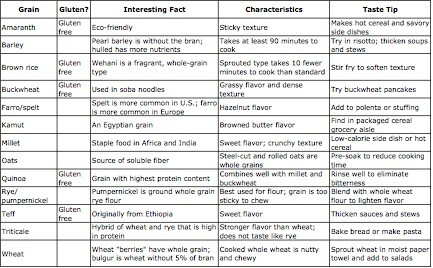 The chart lists all of the whole grains along with their characteristics and other intereting food facts. The economist in me also decided to do a cost comparison among the whole grains. So I searched for each whole grain on Amazon, and chose the first one listed to create a relative whole grain price index. I divided the price per ounce for each of the whole grains. 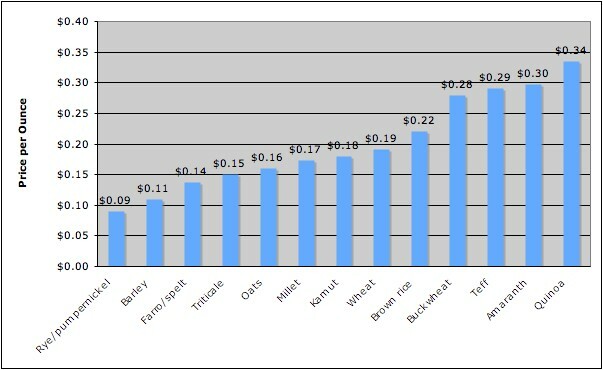 It is interesting to note that the spread among the prices for the whole grains is not too large, although rye is the least expensive and quinoa is the most expensive. Compared to alternative sweeteners, whole grains are a relatively good deal! If you are willing to buy in bulk, Whole Foods Market allows customers to special order bulk items in “case” quantities to receive a 10% discount off regular bulk retail price. It’s another way to keep your grocery bills on a budget. I now have my sights on some other whole grains to try…which do you plan to try, or which ones do you already use? The past few days have brought news from the fast food and packaged food industries, highlighting actions to increase healthy food options for children. –Promote the healthful menu options. In addition, to avoid federal regulation being imposed, some of the nation’s largest food and beverage companies including Kraft, Kellogg, Nestle, Coca-Cola and PepsiCo have come together through self-regulation to restrict the kinds of products they advertise and market toward children. A number of food types including juices, dairy products, grains, soups and meals will have limits on the amount of calories, sugar, sodium and saturated fat allowed in foods promoted to children. As it stands, the recipes of about one-third of all food beverages would have to change or the companies will not be able to advertise those products after December 31, 2013. These recent actions by the fast food and food products industries are positive steps to offer healthier options for customers.